New sales numbers are out for the SW Florida real estate market and we’ve been pouring over the numbers and we’ve come to the conclusion that sales are directly related to the amount of inventory on hand. We can’t sell what we don’t have, and if we had more we could sell more. Perhaps a better headline would be sales are directly related to the amount of fairly priced homes on the market. In any market, up, down, or sideways, there are always fairly priced homes and overpriced homes. The fairly priced homes sell in any market, and the overpriced homes fail to sell in any market. The median sales price fell in May to $195,000 from $200,000 in April, but it is up 10.6% over May 2013 levels. Inventory rose slightly to 5,540 listings which was up 6.3% over last year. Each month new listings come to the market and some are selling, and some are not. Pending inventory fell 10.9% from last year, so we’ll keep an eye on inventory rising and pending inventory declining in the coming months. I’d like you to look at the two charts provided. They may look confusing but it’s really not. One is the median days on the market by price range and the other is the months supply of inventory chart. 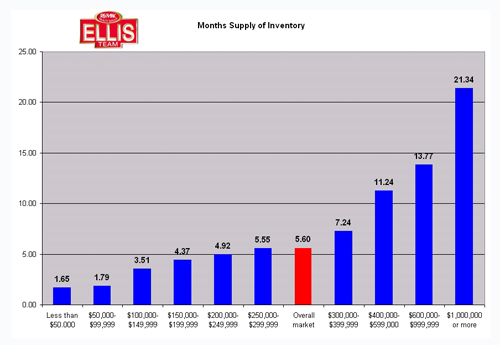 The difference is the months supply of inventory takes into account all single family listings to give you an idea of how much is on the market. The median days on the market by sales price chart only looks at homes that actually sold, not all listings. These are the listings that have won the home selling game. If priced correctly, a home will sell, and these homes did. 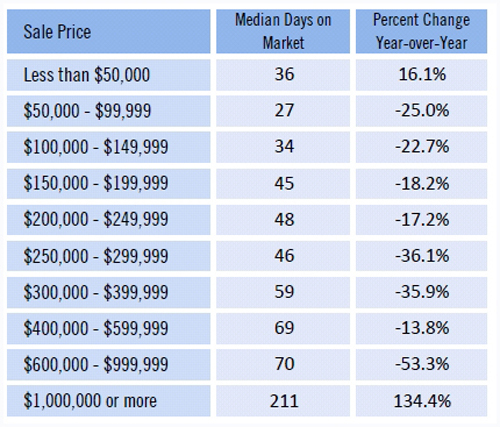 In other words, if a home is going to sell, these are the median average times it will take. If you have a home on the market you can lookup what price range you’re in and see the median time. If your home is over the median time, perhaps your home is overpriced and isn’t going to sell. That’s a tough pill to swallow when you read headlines that say the market is improving, and there are multiple offers on many properties. This is all true. However, there aren’t multiple offers on all properties. And some properties receive no offers. It doesn’t matter how good the market is, nor how much marketing your Realtor throws at your property. If it’s overpriced, it’s not going to sell. Cash sales have fallen to 52% of all sales, and this time of year they typically fall further. Financed sales must appraise, and we have seen some appraisal issues on properties lately. If your home isn’t selling, it’s time to have a conversation with your Realtor about proper pricing. The seller may set the price, but the market determines the value. If your home is over the market, then it’s not really on the market. If you wish to sell you’ve got to price your home at or close to where the market is. Some sellers don’t really care if they sell, so they continually keep their home over the market and if a buyer comes along and pays more than market, they’ll sell. We’ve all seen these listings. They just linger on the market and make all the fairly priced homes look good. They get fewer showings and few offers, because serious buyers offer on fairly priced homes first. They don’t waste time offering low on overpriced listings. Buyers go for value, and overpriced listings don’t offer value. This is probably the biggest mistake we see sellers make. They assume buyers can always make an offer, but they don’t. Many times the overpriced home is invisible to the buyer because it’s over where they’re looking. We don’t suggest under pricing your home. Just price it fairly and you’ll be glad you did. Good luck and Happy Selling! Posted in Cape Coral Real Estate, Fort Myers Real Estate, Southwest Florida Real Estate. Perhaps you’ve tried various search sites and gotten confused on how to search the SW Florida MLS. As a consumer, it’s not always easy navigating search sites and knowing the lingo and field definitions of the MLS which you don’t have access to. I came across a nifty sitemap on our website that provides shortcuts to some useful searches in the Fort Myers MLS. We did another one for Cape Coral Homes For Sale which displays search results for single family homes in Cape Coral without having to select more criteria. Some people want more search options and some desire quick and easy search results. We wish to proved you what you’re looking for. 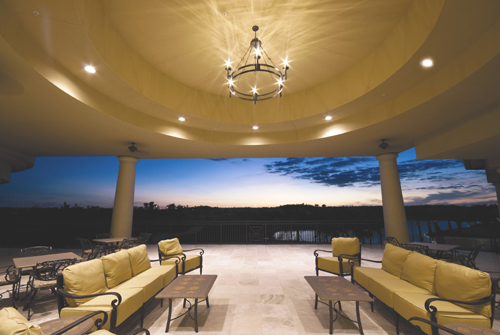 This past year our team has sold several new homes in the The Plantation Gated Golf Course Community in Fort Myers Florida so we thought we’d tell you a little but more about this community. 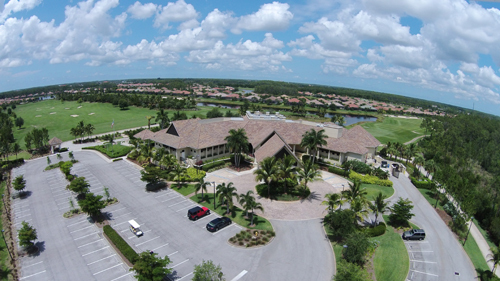 Here is an aerial view of the clubhouse. With over 30,000 square feet The Great House as it is called by the developer features an interior similar to a British Colonial manor home. It features restaurant and a bar with two fireplaces. RE/MAX has had our Holiday office party at the clubhouse twice and a good time was had by all. The clubhouse has a golf pro shop, men’s and women’s locker rooms, a billiards room, gathering room, and a meeting room. 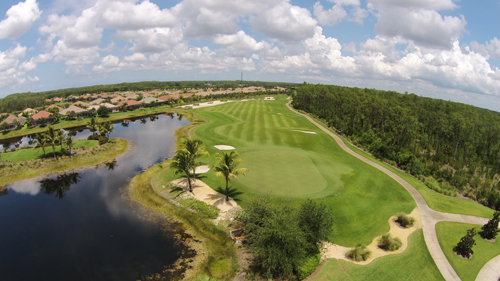 The 18 hole championship golf course was designed by Hurdzan-Fry and is perfect for players of all skill sets. It is a 7,233 yard course with a variety of tees that provide various angles of play and is generally considered a fun but challenging course. Somerset Hall is the hub of the Somerset at the Plantation community. It is a large activity center where the community can meet and socialize and features an on-site activities director. 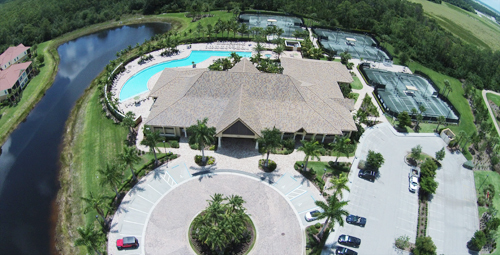 Somerset Hall features a resort style pool, spa, fitness center, aerobics room, massage and sauna rooms, locker rooms, tennis courts, billiards room, TV & Internet lounge, library, and community room. 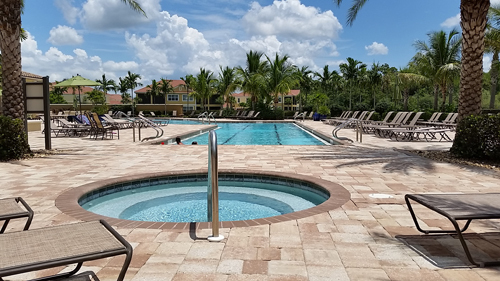 Residents enjoy the resort style pool as a place to unwind or get some sun in. The floor plans aren’t bad either. 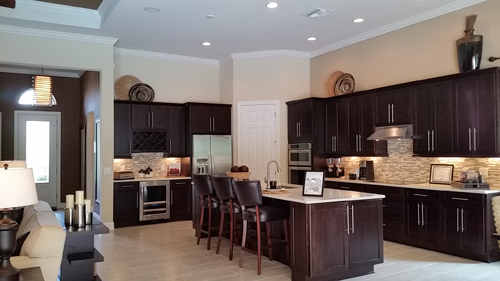 Here is a photo of the kitchen in the Dartmouth II model. By the way, we hear they’re building all new models. The Plantation also has another section called Bridgeport at the Plantation with different floor plans as well. We have plenty more photos we could show you, but there’s no substitute for seeing the Plantation in person. Let one of our buyer specialists help find your dream home at the Plantation, or wherever your dreams take you. We know the area, we know the development, and we know the builder. It pays to work with an agent who can listen to your needs and recommend the best product for you. Posted in Fort Myers, Fort Myers Real Estate, Gated Community, Golf Course Property, Southwest Florida Real Estate. What is a 4 Point Home Inspection? Most buyers are familiar with a typical home inspection where the buyer hires an inspector to inspect a home they are purchasing to see what defects or required repairs the home may have, as well as informative maintenance type issues. However, you may be curious about a 4 point home inspection. You may have heard the term 4 point inspection thrown around as well. 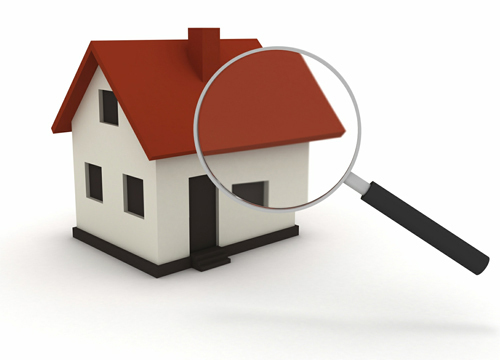 A 4 point inspection is a separate inspection report many insurance companies require on homes 20 years old or more. Citizens required them on homes 30 years old or more. Some companies are requiring them on newer homes as well, so it’s always good to check with your insurance company as getting a 4 point inspection is less expensive if added on to a regular home inspection. The 4 points are heating and air conditioning, electrical wiring and panels, plumbing connections and fixtures, and the roof. Insurance companies have become increasingly reluctant to issue Homeowner Insurance Policies on older homes (usually 25 years old or more). Their common concern is that there may be conditions in an older home that could become a liability to them. For instance; a home with a roof nearing the end of its reliable service life may fail while under the policy and the homeowner may seek reimbursement from their insurance company for damages to the home or its contents. Similar concerns extend to the condition of the HVAC, electrical and plumbing systems in an older home. If these elements are in poor condition, in need of being updated or replaced or were improperly installed, they may fail and cause fire or water damage to a home. Newer homes are assumed (by the insurance companies) to not have these problems as frequently as older homes. There is a standard form for this type of inspection that must be filled out by a qualified inspector or contractor. There is also a Uniform Wind Mitigation Verification Inspection which provides significant discounts to a homeowner if the home qualifies. The state has recently changed the reporting rules this year making it harder to qualify for such discounts. More proof is needed in the report including photos. There is also a Roof Certification Inspection insurance companies require when the roof is approximately 15 years old. The 4 point inspection report may suffice if your insurance company asks for this inspection. Check with your company. Last week an insurance company sent over their own person to check on one of our listings for an upcoming closing. I checked with an insurance agent who said more and more insurance companies are starting to send their own people over to perform these inspections as they are not fully trusting the reports they are receiving. This may cost the insurance company more money upfront, but it is a signal that they are increasingly looking to limit exposure and risk. Not only must a seller satisfy the buyer, the lender, the appraiser, but now also the insurance company before a home can be sold. If the home has polybutylene plumbing you can forget about an insurance company insuring the home. The home must be re-plumbed. Buying and selling a home today has become more complex. With new Dodd Frank regulations being written and taking effect combined with new insurance disclosures and requirements it’s a wonder anything gets done. Inspectors have to fill out more reports so they must charge more. As regulations increase Realtors will have to charge more in the future. State Farm now requires their own forms be filled out by inspector on a PC, not a mobile device so inspectors are charging more for State Farm inspections. Yesterday I had to go back out to a property under contract and photograph certain things for an appraiser to go in that report. Appraisers and insurance companies are documenting everything. We’d strongly recommend getting a 4 point inspection as an add-on to your regular home inspection. It just might save you thousands on your home insurance, and it might come in handy when you go to sell the property, even if your insurance company doesn’t use it. Posted in Cape Coral, Cape Coral Real Estate, Fort Myers, Fort Myers Real Estate, Lehigh Acres, Southwest Florida Real Estate. A new form just arrived June 1st informing buyers of what the homeowners insurance and flood insurance may cost, and if the cost exceeds the amount disclosed then buyer may have a right to cancel contract. There have been significant changes to homeowners and flood insurance policies and costs in the past few years and some are quite surprised at the hoops they must jump through to obtain affordable insurance. The Ellis Team is strongly encouraging our sellers to provide an elevation certificate so we can obtain upfront what the flood insurance costs will be. Without the elevation certificate insurance agents are forced to quote off the base elevation which can be much costlier. Some buyers were surprised to find out flood insurance was tens of thousands of dollars on a property. This is one reason the National Association of Realtors urged Congress to make changes to the flood program. These changes are in effect now, but having the elevation certificate helps. Many people don’t realize the buyer can assume the seller’s flood policy. This is worth examining as well. Homeowners insurance has seen its share of changes too. Wind mitigation surveys can significantly reduce policy premiums on homes, especially homes built before 2002. Older homes are getting costlier to insure because they were built to lesser codes. I called Peter Craig over at Pacific Crest Insurance as he has been bailing us out and saving deals for us from surprised buyers brought in by other agents who didn’t know about inspections and saving money. Peter told me about a company that is charging $800 to nail in clips so that the insurance companies will reduce premiums. If the home has certain features like hurricane clips or straps the premium is reduced. Homes built before 1985 typically don’t have either so having nails put in helps with costs. He also told me about a survey company that does elevation certificates quickly. We ordered one for a property because the seller didn’t have one and got it back within a few days. I think the seller paid $130 or so for the certificate, but it saved his deal and saved the buyer thousands on insurance. Many buyers qualify for the home, but when they find out the homeowners and flood insurance costs are so high without these discounts they no longer qualify. I’ve talked with several agents who have lost deals because buyers no longer qualified for the home. It’s knocking them out on their ratios on the monthly payment. Sellers used to not care because it was the buyer’s issue, but that’s no longer the case. It’s not about if the buyer pays more in insurance, it’s about whether the buyer can still qualify for the home. Most buyers buy as much as they qualify for, but when insurance costs are double or triple what the lender used for their monthly payment, it knocks them out of the deal. Now sellers care, and if they don’t, they soon will when they start losing deals on their home. Even if the buyer hasn’t bought as much as they can afford, they still shy away when they see high yearly insurance premiums they weren’t prepared for. Now the new disclosure addresses this upfront, which is a good thing. For it to work properly, getting quotes before you find the buyer is essential, so I’d recommend real estate agents find a good insurance agent and do the research on each listing before you find the buyer. Having the elevation certificate is crucial. A wind mitigation report is helpful as well. It’s so much easier to sell a home once than several times. Getting this information upfront can save deals and get the sellers on their way to their next property and get buyers into their home the first time. It’s more work on the front end, but it will help keep deals together and save work on the back end. Posted in Cape Coral, Cape Coral Real Estate, Fort Myers, Fort Myers Real Estate, Lehigh Acres, Reflection Lakes, Southwest Florida Real Estate. Lately we’ve had multiple offers on several of our listings, especially in the $250,000 price range and under. We thought it would be good to update the months supply of inventory graph so buyers and sellers could see what price ranges are Hot. 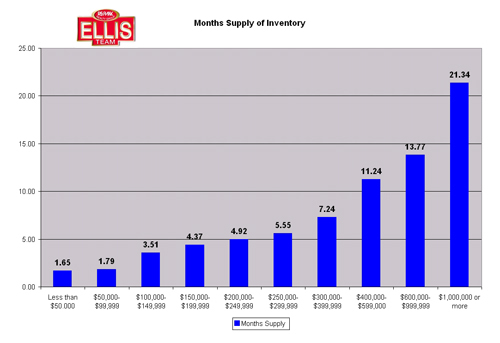 As you can tell by the graph, anything up to about $300,000 has a low supply of inventory. All price ranges have come down since we last posted this graph in January. The $200,000-$400,000 numbers haven’t moved much. Back in January the $200-250 range was 4.92 months and today it’s down to 4.90 months. The $250-300 range was 6.19 months and today it’s down to 5.55 months. The $300-400 range was 7.83 back in January and today it’s at 7.24. All lower numbers but not much movement. Where we have seen some significant progress is in the $600,000+ ranges. The $600-1 Million range was at 15.96 months back in January and today it’s down to 13.77 months. The $1 Million + homes was at 32.61 months which was almost a 3 year supply of homes on the market. Today that number is at 21.34 months. We’ve shaved almost a whole year off those inventory levels which is pretty remarkable in only 5 months. Homes sitting at $400,000 and above have been competing in recent months with new construction. Even many of those homes have been bought up so inventory is tightening in some sub-markets. For instance, we’ve sold several new homes at Hampton Park. They just ran out of inventory until December. Sales at the Plantation have been strong as well. When builders run out of inventory it does throw buyers back into the resale market, if the price is right. Speaking of prices, we had over 300 potential sellers check out our online pricing tool last week. www.swflhomevalues.com Many found that to be a useful tool to see where they stand in the market as they contemplate potential changes. If you’re considering moving up or moving out, now might be a great time to speak with us. We can present you with your options. One reader didn’t like the bank’s recent appraisal on his home so he used our service. He didn’t like that price either as it was very close to the bank appraiser’s number and he was hoping for a higher number so he could refinance. We’ve never been to the property so we can’t say, but it does show that our service in many cases should be close or at least in the ballpark to what banks are appraising for. We had several readers comment on our new Marketing in High Definition Program as well. www.HomesInHD.TV We are using a drone to take high definition video outside and high definition video on the inside and putting together a professional video for buyers. The advantage to video is the online video is 53 times more likely to be found on 1st page of Google and Bing than any other form of content, and the Ellis Team is leading the way to getting seller’s property rated high online. Good luck and Happy House Hunting!! !